The question of what would be exported began with the NBA, Beyoncé and Neil deGrasse Tyson, but then Awesomely Luvvie got on board, and suddenly the list expanded to include Jesse “Magic but Real” Williams, shea butter (correction: all butters matter) and baby hair. But as America descends into the nether regions of President Bannon’s new world order, black people might want to consider taking a bit of sardonic internet humor to another level, because black men and women of the African Diaspora have been living and thriving in other parts of the world for an age—and Sweden’s capital, Stockholm, is just one example of a city doing it a lot better than the United States. 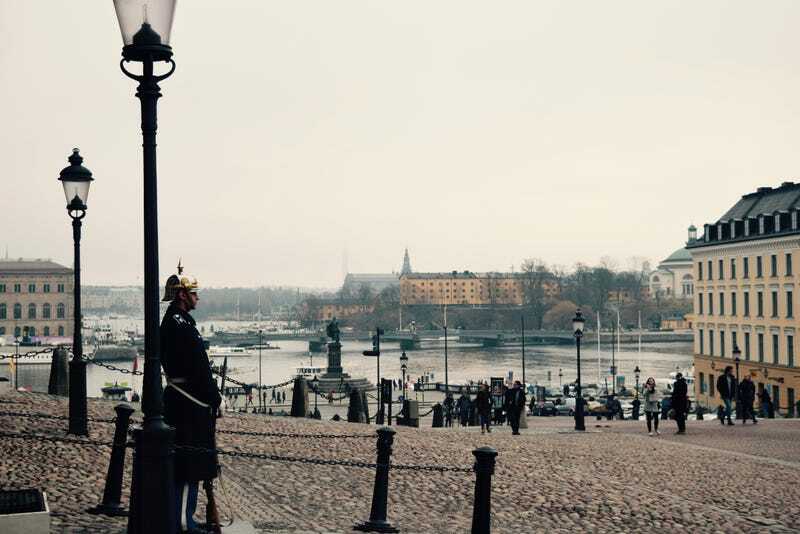 From an aesthetic point of view, Stockholm is straight out of a fairy tale—with breathtaking architecture; clean streets; fast, reliable public transportation; a strong emphasis on fresh food; and a sustainability culture that has made recycling a fine art. And with a personal income tax rate that sometimes reaches 57 percent, the city’s population of 910,000 benefits equally from a strong infrastructure, free tertiary education and an aggressive stance on gender equality, right down to the 480 days of paid parental leave. I have never seen so many dads pushing babies around, without women, in my entire life. They did it in gym clothes, in jeans and in tailored business suits while holding cellphones to their ears. While eating at famed bakery Vete-Katten, I observed family after family divide feeding, burping and diaper-changing duty straight down the middle with military precision. It was clear to me in less than a day that Swedes have that whole gender-equality thing down to a science. … But ethnic diversity is another thing altogether. Twenty-seven percent of the city’s population comes from an immigrant or non-Swedish background, and the largest ethnic minorities include people from Finland, Iraq, Iran, Bosnia, Turkey, Croatia and Serbia—with even smaller ethnic populations from a variety of East African countries. But for black people in America, being a minority isn’t anything new. The question is, is Sweden really a great place, or is it just a great place for ethnic Swedes? The true nature of the city’s culture of inclusivity and ethnic diversity is, unsurprisingly, best grasped by speaking to people of color who have made that migration themselves. That’s what Patrick Gibson says. The 69-year-old hospitality professional relocated to Stockholm from Barbados to be closer to his son, whose mother is Swedish. “If they don’t know you, they’ll just keep on walking … but once you’re introduced and they’re familiar with you, they’re the best people to know,” he adds. In 2011 he founded the Barbados-Sweden Cultural Association to address what he saw as a cultural void among Barbadian youths living in Sweden who wanted to reconnect with their roots. With his son in mind, Gibson made it a personal quest to examine the country’s racial past, which is why he co-authored the book Svart i Sverige (“Black in Sweden”). Fascinated by the history of blacks in Sweden, in his book Gibson observes that much like other European countries, Sweden’s past includes a chronicle of colonization, slave trading and the varied historical ways in which black people have contributed to modern Swedish culture, even if it isn’t widespread public knowledge. Walking through a shopping center in Rinkeby, I observe the infinitely greater population of black people, women in Islamic dress and the use of non-Swedish languages. Gibson says that like many ethnically diverse neighborhoods, this one has a reputation for being dangerous—though I never got that impression from my time there. But while modernity has certainly been good to Swedish families, the economy and the environment (which Gibson describes as the holy trinity of Swedish values), there are distinct elements of racism that remain tangible components of everyday Swedish life; but it’s Swedish stoicism that prevents Afro-Swedes from articulating these grievances, suppressing a large part of their lived experiences from coming to light. This is why programs like Melanin, a Swedish youth program that looks at the everyday lives of Afro-Swedes, has become so popular and is so important to changing the conversation on diversity and cultural inclusivity. Ali’s family comes from Sudan, and they migrated to Stockholm when she was a small child. For her, the excitement generated by Melanin is a reflection of what has been missing in Swedish race dialogue, a conversation that she says is much more evolved in the U.S. because people aren’t as concerned with appearing politically correct. Ali says that when she was a teenager, she internalized popular images of Swedish beauty from TV and magazines, which didn’t feature anyone who looked like her—leading her to feel deeply insecure about the color of her skin and the texture of her hair, the constant subject of curiosity from other students. “What’s considered normal here is the white body, and what’s considered normal here is the white culture,” says Ali. This makes sense when placed in context within Sweden’s history. Despite its modern reputation as a liberal darling, it was only 1922 when the country established the National Institute of Racial Biology at Uppsala University, where objectives included experiments that divided people by race and involved genetically modifying the shapes of people’s heads, a program later snatched up by Nazi Germany’s eugenics program … in search of the perfect white body. But Swedish convention dictates that pointing this out, or any racially charged subjects in general, regardless of how justified, is just a recipe for trouble. “I definitely get called the angry black woman for bringing stuff up, reacting to comments,” says Ali. It’s a painfully familiar scenario that could take place anywhere in the U.S., but given the unspoken agreement among Swedes to live in overall denial of any racial tension, it should be no surprise that conflicts have been popping up in recent years. In 2013 the Husby Riots, sparked by the police shooting of a 69-year-old Portuguese man, shook Stockholm’s idyllic facade and awakened people to a brooding feeling of discontent among migrant and minority communities pushed to the outskirts of the city. It’s there, says Ali, where they feel marginalized, invisible and suspicious of any police presence. At a gorgeous bar in Gamla Stan, with a view of the Royal Palace, some locals asked me about my impression of Sweden. I expressed my overall approval and, in turn, inquired about the riots. The question was quickly dismissed with a waved hand, and someone offered to buy me a beer instead. Up until then, I had been having a great time talking to strangers, eating semla and deciphering their incomprehensible language.